When we talk about coastal photography we may mean cliff top photography generally way form sand and sea water that our cameras and lenses would not like to experience, but we may also want to venture closer. Most modern digital cameras are not dust proof or sand proof, and sea water is not going to be good for them, If you have to take a camera onto a beach its a good idea to have at least a zip up plastic bag to keep everything out of it and that you don't see blowing about gets in everywhere. Have you had sandwiches on a beach crunch, crunch!! There are both water proof housings and simpler protective arrangements that can be bought. 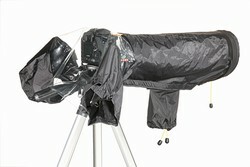 There is a home made solution that can protect a camera from sea spray and is useful when photographing from a boat of near breaking waves. 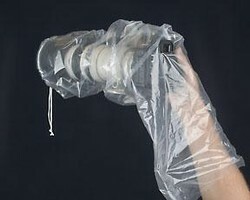 All you need is a largish clear plastic bag, large enough to put your camera in as well as your hands and to hang down covering a part of your arms. Work out where you would like to put the camera and then where the lens is to look through, cut a hole just smaller than your camera lens. To do this draw around a filter and cut inside the line drawn. 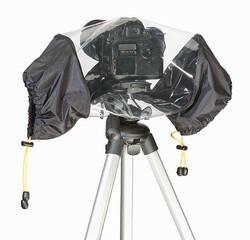 Using a filter you will be able to trap the plastic bag between the filter threads and the lens. Just be careful when doing this so as not to damage the filter threads on the lens. Some people use a stepping ring or filter shim to attach to the lens, so no damage can occur to the lens and have a larger filter, so that the edge of the plastic bag is well clear of the edge of the lens. You will see this arrangement allows you to see through the plastic bag, but the camera to see through the filter, while remaining protected. A less effective solution is to wrap cling film around the camera and lens. If you have recently upgraded your digital camera you may have a camera that you are not now using and perhaps a spare lens as well. If you are going to do quite a bit of coastal work close to sand and sea water it may be that this older camera and lens could be used. Some professionals when they undertake beach shoots hire equipment to use for this rather than taking their own equipment in to this environment.